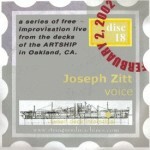 This is an eighteen minute improvisation for voice, whistling, and found objects, recorded on the Artship in Oakland, California, on 02/02/02. I was passing through the San Francisco Bay Area on my Surprise Me With Beauty book tour and had the opportunity to make a recording for Hugh Livingston’s Artship Recordings label. The Artship was a retired Navy ship, docked in Oakland. It had been converted for use as an arts space, with galleries, performance areas, and the like. The Artship Recordings project brought musicians in to record improvisations of up to twenty minutes, which were released on a series of 3-inch CDs. Each musician was free to determine when in the ship to record and what to do. I chose a large space that, if memory serves, looked rather like a gym, and may have been outfitted as one. Tom Bickley set up his recording gear at one end of the space. I started in a far corner, whistling and tapping on metal bed frames that had accumulated there. (The whistling is quite quiet, and the tapping is rather loud, so set your volume accordingly.) Over the course of the improv, I moved from that corner up to the mikes then away again. After some non-verbal vocalizing, I started improvising poetry based on what I saw and heard there. In the course of it, looking more closely, I spotted words and phrases written and carved into the surfaces of the room. I incorporated them as I went along. This is one of my strongest vocal performances, and the only occastion that I can recall in which I successfully improvised poetry. Usually, my poetry is written down, and my improvisations are non-verbal. This is a rarity and, I hope, an effective one.